For the spider genus, see Cithaeron (spider). Cithaeron or Kithairon (Κιθαιρών, -ῶνος) is a mountain and mountain range about 10 mi (16 km) long, in central Greece. 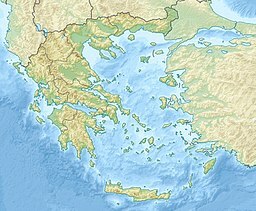 The range is the physical boundary between Boeotia in the north and Attica in the south. It is mainly composed of limestone and rises to 4,623 ft (1,409 m). The northeast side of the range is formed by the mountain Pastra. The range was the scene of many events in Greek mythology and was especially sacred to Dionysus. In Euripides's Bacchae, Dionysus carries out his dances and rites with his bacchants, his priestesses, on Cithaeron. Oedipus was exposed on the mountain, while Actaeon and Pentheus were both dismembered on its slopes. It was also the place where Heracles hunted and killed the Lion of Cithaeron. In historic times, the mountain acted as a backdrop to the Battle of Plataea of 479 BC and was the scene of much skirmishing before the battle itself. In later times fortifications were built both at Plataea and Erythrai as the mountain formed the disputed natural border between Athens and Thebes. Gardner, Ernest Arthur (1911). "Cithaeron" . In Chisholm, Hugh (ed.). Encyclopædia Britannica. 6 (11th ed.). Cambridge University Press. p. 395.